CALMER AND HAPPIER DOG, LESS STRESSFUL SITUATIONS AND MORE PEACEFUL HOME OR YOUR MONEY BACK – Help your dog relieve anxiety and relax when exposed to thunderstorms, fireworks, loud noises, while traveling and going to the vet or the groomer and when having separation anxiety. 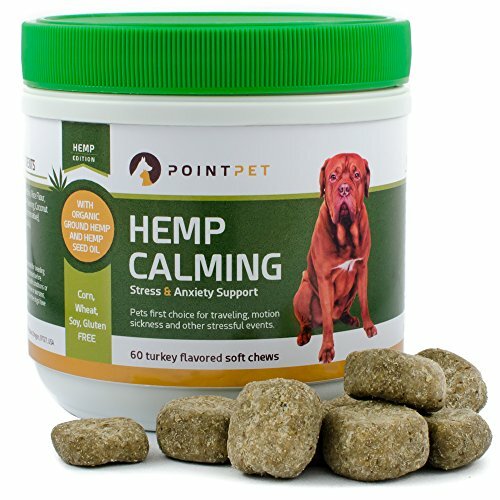 Our delicious anti stress calming SOFT CHEWS will gently calm your dog down without making him drowsy and lethargic. It takes ONLY 30 MINUTES to work. Perfect solution for a quick stress relief. 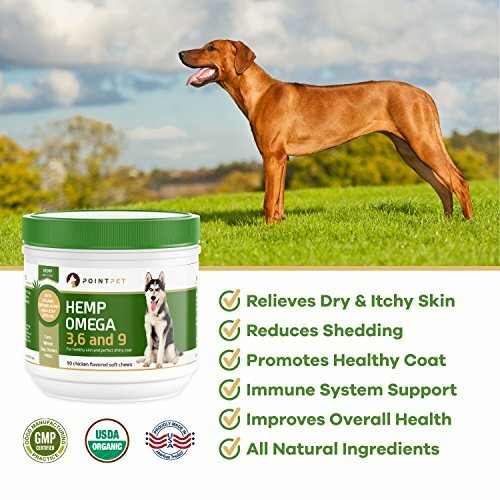 IMPROVE QUALITY OF YOUR DOG’S LIFE WITH THE AMAZING BENEFITS OF HEMP OIL – Hemp seed is both rich in polyunsaturated fatty acids (PUFAs) and high in digestible protein making it a nutritional powerhouse. 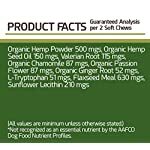 It’s a perfect natural alternative to support your dog’s life quality and longevity. 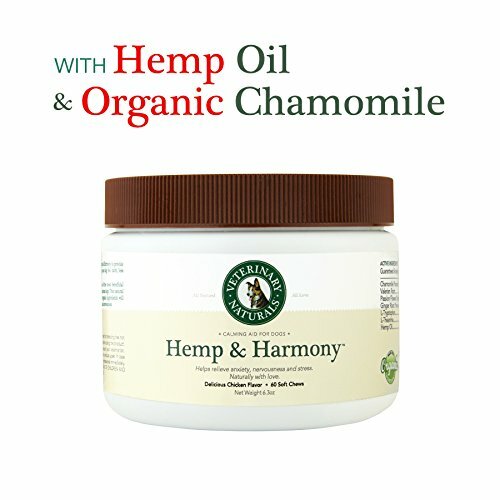 Hemp seed oil is a super food packed with high quality essential nutrients that dogs need for on-going health and wellness. Our NO HEAT COOK PROCESS can produce the highest-quality hemp seed supplemental treat. 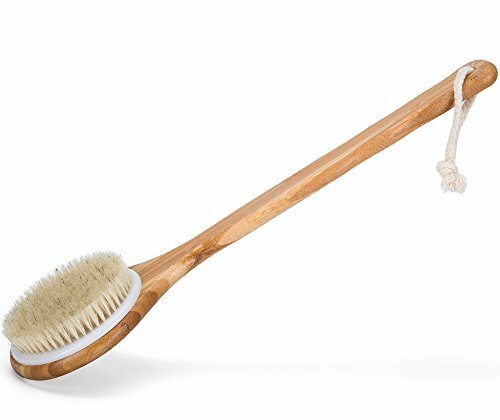 NO MORE HARD TIMES SETTLING YOUR DOG DOWN AT BEDTIME & START ENJOYING PEACEFUL NIGHTS – Restless dog and barking from dusk until dawn is a thing from the past. Our calming dog treats contain CHAMOMILE that helps calm nerves and induces sleep. 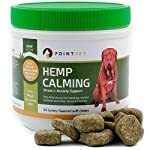 It will help your dog relax and get a sleepy mode on. You can finally have a peaceful night sleep. And your neighbors too. If you have an extra hyper dog who never stops moving, calm supplement will help your dog to actually lay down and be calm. 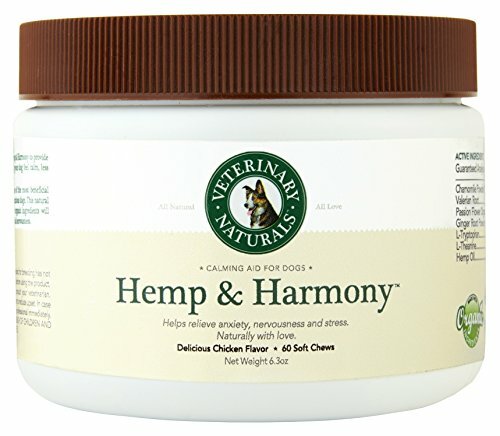 Now You Can Finally Help Your Dog Be Happier, Healthier And More Relaxed With Our Calming Hemp Supplement! Almost every dog will experience some kind of anxiety right through his lifetime, such as thunderstorms, fireworks, loud noises, people, travel or other stressful situations. 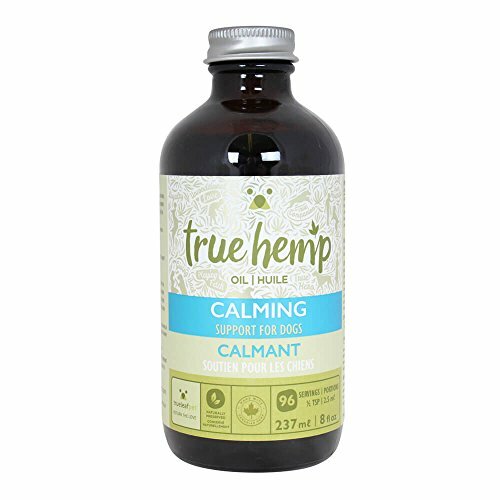 Having this supplement all the time within reach allows you to have more joyful and peaceful time with your dog! 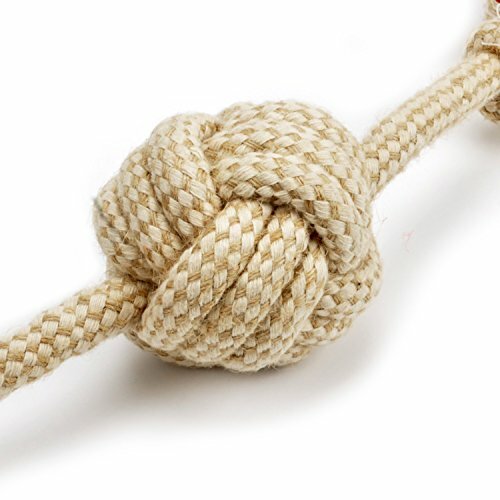 Less Stress, More Health and Good Mood Has Never Been Easier to Achieve! 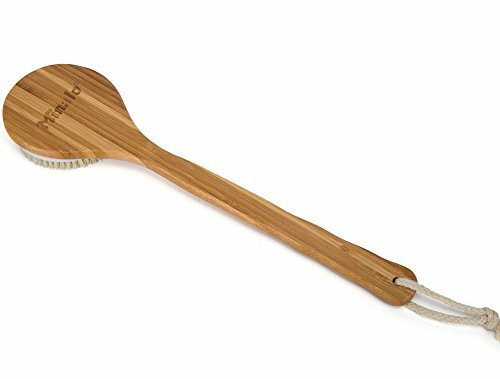 Help your dog live healthier and stress free life. 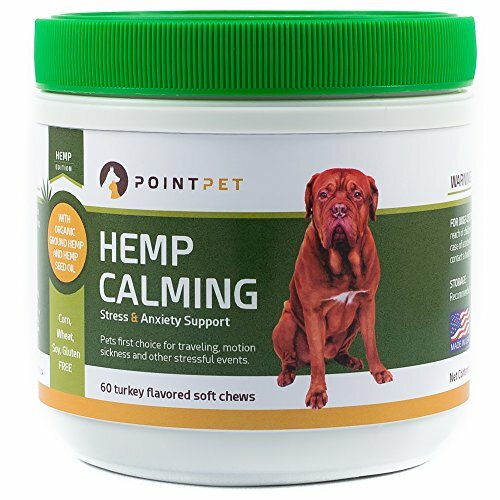 With our calming formula your dog can be relaxed, happy and healthy in any situation. 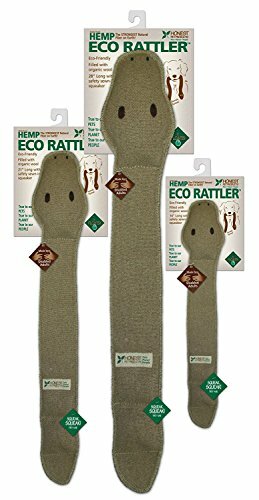 Proven safe without harsh sedatives and medications. No More Fearful, Hyper and Anxious Behaviour! Improve Your Dog’s Calm Behavior And Performance ! ADD TO CART NOW to Find Out What You’ve Been Missing! If you don’t seem to be completely satisfied with our product, contact us for a full refund. 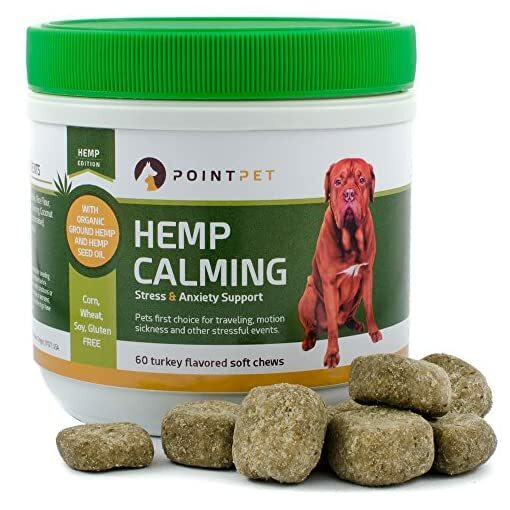 CALMER AND HAPPIER DOG, LESS STRESSFUL SITUATIONS AND MORE PEACEFUL HOME OR YOUR MONEY BACK – Help your dog relieve anxiety and relax when exposed to thunderstorms, fireworks, loud noises, whilst traveling and going to the vet or the groomer and when having separation anxiety. 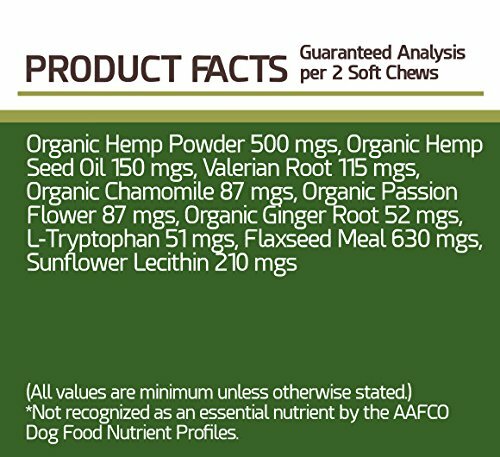 Our delicious anti stress calming SOFT CHEWS will gently calm your dog down without making him drowsy and lethargic. It takes ONLY 30 MINUTES to work. Perfect solution for a quick stress relief. 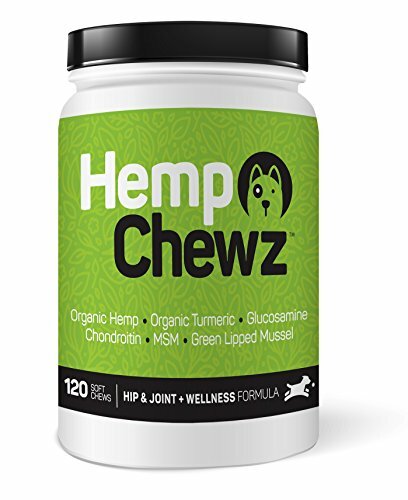 IMPROVE QUALITY OF YOUR DOG’S LIFE WITH THE AMAZING BENEFITS OF HEMP OIL – Hemp seed is both rich in polyunsaturated fatty acids (PUFAs) and high in digestible protein making it a nutritional powerhouse. 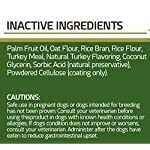 It’s a perfect natural alternative to enhance your dog’s life quality and longevity. 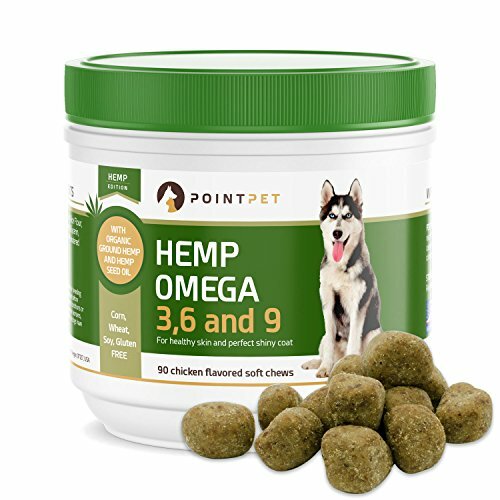 Hemp seed oil is a super food packed with prime quality essential nutrients that dogs need for on-going health and wellness. Our NO HEAT COOK PROCESS can produce the highest-quality hemp seed supplemental treat. NO MORE HARD TIMES SETTLING YOUR DOG DOWN AT BEDTIME & START ENJOYING PEACEFUL NIGHTS – Restless dog and barking from dusk until dawn is a thing from the past. Our calming dog treats contain CHAMOMILE that helps calm nerves and induces sleep. 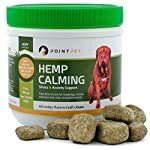 It’s going to help your dog relax and get a sleepy mode on. You’ll be able to finally have a peaceful night sleep. And your neighbors too. 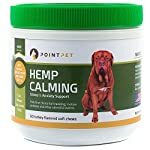 If you have an extra hyper dog who never stops moving, calm supplement will help your dog to actually lay down and be calm. 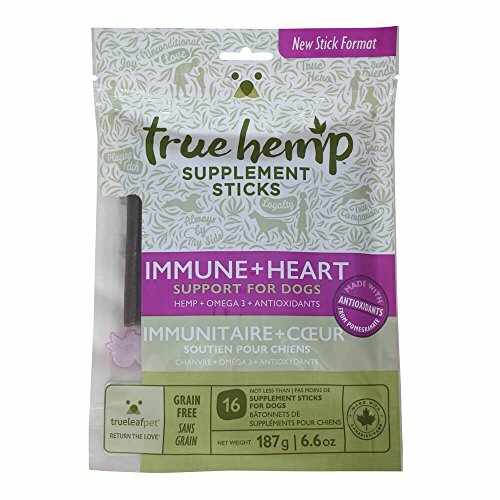 MAINTAIN A BALANCED AND POSITIVE MOOD, REDUCE DOG’S STRESS AND PROMOTE HIS GOOD HEALTH – Perfect combination of ALL NATURAL AND HERBAL ACTIVE INGREDIENTS like chamomile, passion flower and L-tryptophan provide the best calming aid and enhance for your dog. 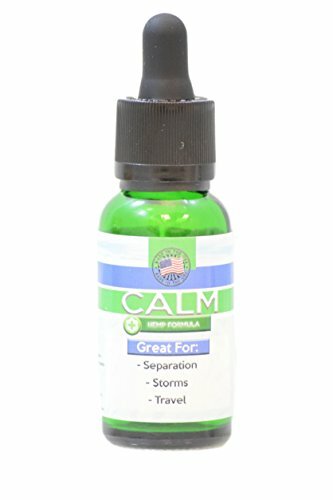 Anti stress and anxiety supplement contains a variety of vitamins that can support brain chemical balance and enhance a good mood and health. 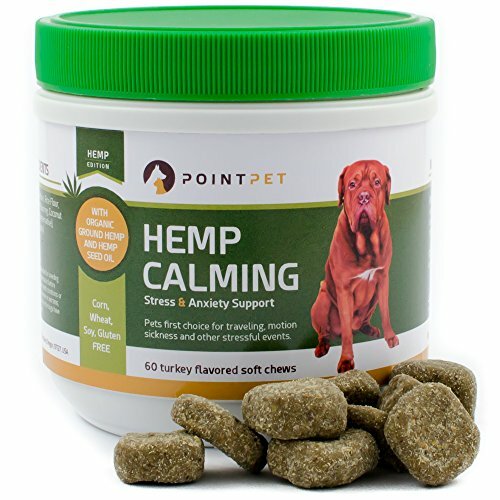 With our calming Treatment your dog can finally settle and have fewer incidents of destructive behavior. STOP WORRYING WHEN LEAVING HOME. 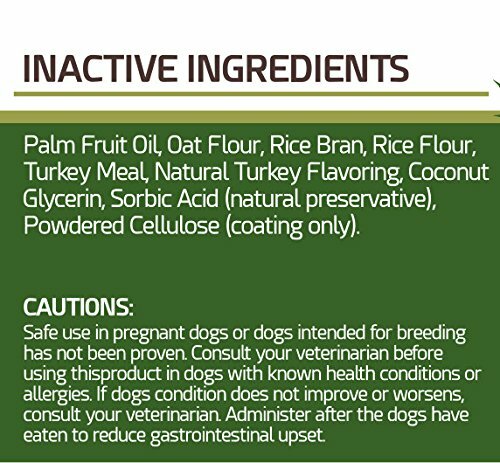 NO MORE DOG’S DESTRUCTIVE BEHAVIOR WHEN LEFT ALONE – If your dog gets upset whenever you have to go out, make sure you give him our natural stress enhance to calm him down. Your dog sitter will be grateful. Active ingredients like VALERIAN ROOT and PASSIONFLOWER will help him to alleviate his fears and separation anxiety. Also great to ease dog’s social anxiety. 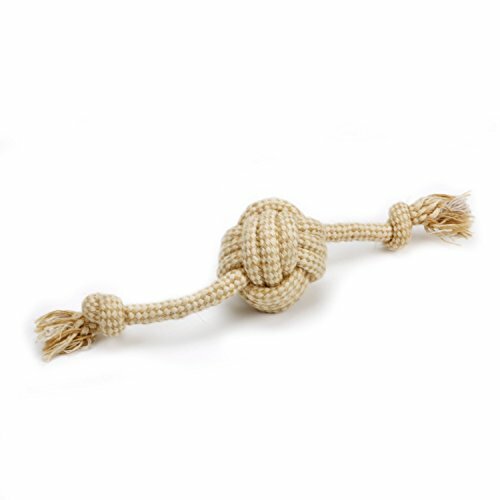 Taking your dog in public or having people over is no longer a nightmare with these anti stress chews.